Been an awful good girl. As I age, I realize the gifts which make me deliriously happy are simple. One of them is stickers. All boxes and mailers and letters leave my house with stickers attached; unless they are mailers from Target. Those things require me to glue my stickers on. Not going to do that. Christmas was a magical time. 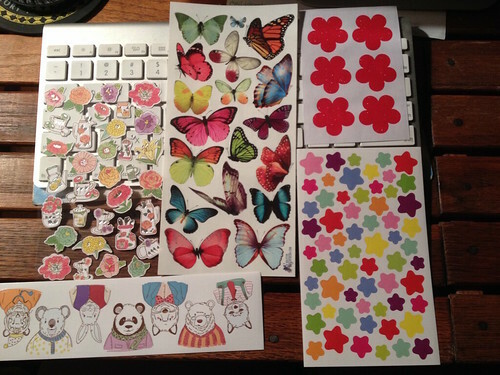 Carole sent me a whole bunch of stickers. I think she went to Hobby Lobby several times to accumulate this mass. My friend, Liz, and my sister also got in on the act. Liz's were all from Disney, thanks to her trip to Disneyland in November, and Sharyn's were all 50 cents or less. I vowed, this year I would be better about writing people. I was gifted with some lovely note cards which don't take hours to draft a note. Thanks to this and a vow to be better about sending cards, I've used up 80% of this stash. 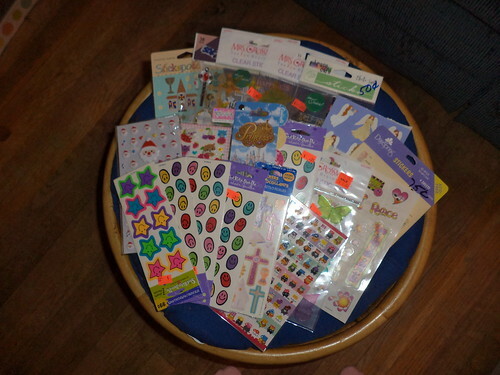 I had to buy more stickers in March because I was running low. I put together Easter baskets for my great-nieces and nephews and bought stickers to put in those, which gave me a few more. But I realized I'd need to, probably in June, set aside some cash and hit up Hallmark. They have neat stickers, even though they are a bit pricey. The last three years, Carole has sent flowers. While very appreciated, 1-800-Flowers was not sending me good blooms. She would get a credit because the flowers would arrive with brown edges or would fail to open. After last year, she said, "I'm never ordering from them again, mom." There are a lot of things which would be great if she wanted to send me something, but she didn't ask so I didn't volunteer. When the Mother's Day card came, she said I have been gifted with a 6 month membership to Pipsticks. Huh? I don't know if you can see them. On the left side of the keyboard are translucent colored raindrops. I'm not sure about the big rainbow piece at the bottom. It might be a place to stick stickers onto. I haven't tried to see if it's one huge sticker itself which would be awesome on the back of a mailer or flat or on the side of a box. 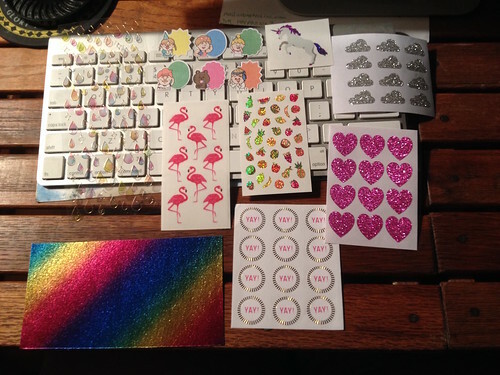 I have a method for stickering packages and I just haven't gotten to that piece, yet. 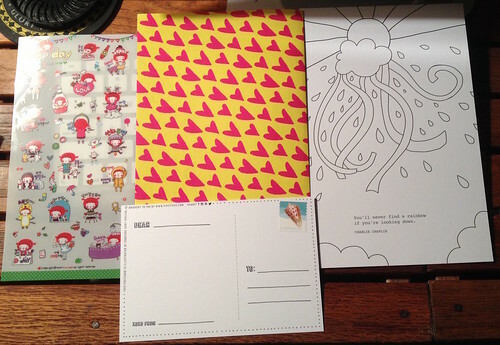 Also included is a picture to color, a pre-stamped postcard and a newsletter, which is the heart covered paper. I sent the postcard to a friend and added the coloring page to a color book I got last year. I am thrilled. I have not used these up. I've been really busy and haven't written a lot of letters. 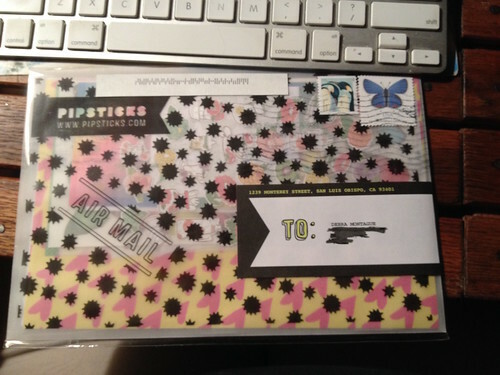 I sent out some parcels right before and right after Memorial Day and it was so wonderful to adorn them with stickers. It was hilarious because I sent a flat to someone who had never received a letter from me. His reaction was priceless. On the guild Facebook page he typed, "OMG! You guys! Letters from Gimm come covered in stickers!" A large number of people responded, "Yes, yes they do." 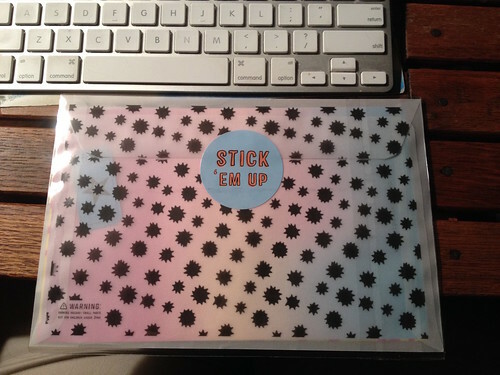 The postcard is blank on the other side so you can use your stickers to create a scene. I just covered the side with anything which would fit. My subscription runs through October. This might become my birthday and Mother's Day gift, I was told, assuming each pack stays as great as this one. In October, I'll have the rest of these to use up. 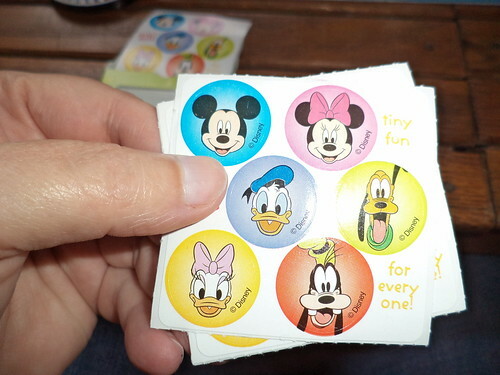 I bought these to use in achievement books when my guild goes to Disney World in October. (See below.) 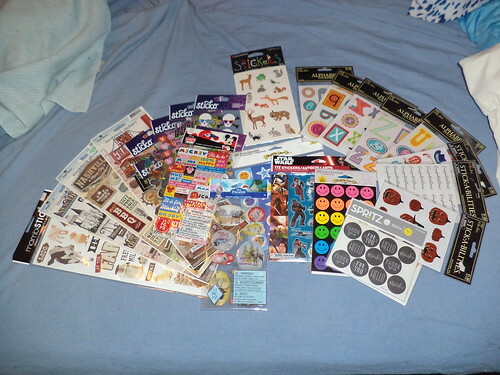 I have two boxes full of stickers. We won't use all of them and the boxes are small enough to carry in my purse for stickering on the go. This makes me so happy. I'm trying to get my life in order so I can sit down and write some notes. If I have to take boxes to the post office, I go to the one near the office. The clerks there get a big kick out of what I mail.